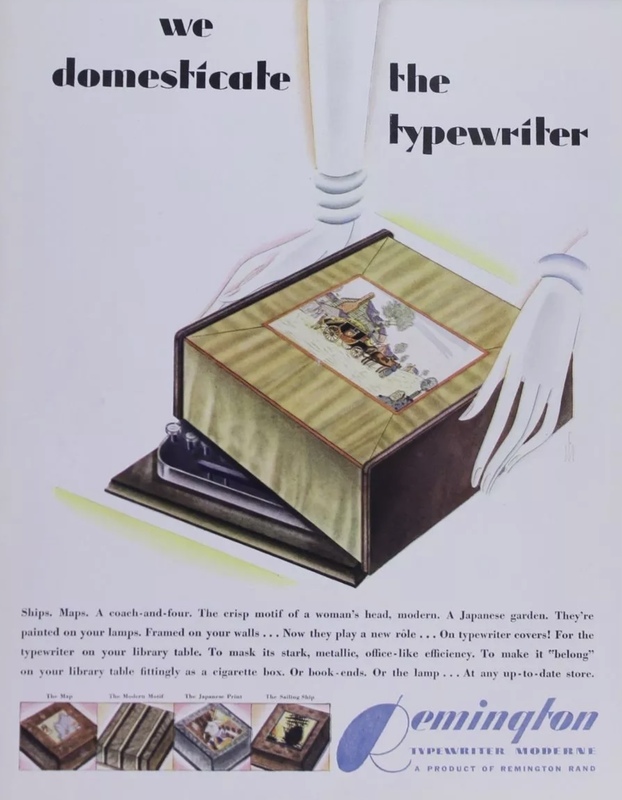 Portable typewriters gained ascendancy in the 1920s and 1930s, but for most consumers portability meant simply that it could be moved around the house easily. In the 1930s, recognizing that consumers mostly left their machines on desks or tables, Remington offered an alternative to the traditional carrying case: a decorative cover. Advertised sometimes as a “fibre” cover, though some may have been made of wood, the facade showed a variety of themes: ships, maps, a coach-of-four, or a Japanese garden. One model, the 3B, was offered with racing stripes. Covers may have been offered as an after-market item by Remington. In the 1930s, to reduce prices, carrying cases were sometimes optional. Or, these decorative covers could have been sold as an alternative to the carrying case at the time of the purchase. It does not appear that many of these covers have survived, nor is it clear how many were sold. If consumers opted for the cover, the bottom portion of the case was included nonetheless. As the covers were made from paper or wood, it’s not difficult to imagine that these decorative items simply deteriorated over time. In the case of the 3B, Remington stopped offering the “fibre” cover in the middle of 1936 (the machine was introduced in July 1935). From around April of 1936, Remington offered the machine with a full carrying case only, raising the price from $31.50 to $34.50. Previously, a carrying case was an option. One senses the domestication of the typewriter failed: consumers still expected a fully carrying case. One last note: when the 3B or 3 Bank was first released, it is likely that neither a case nor cover was offered. 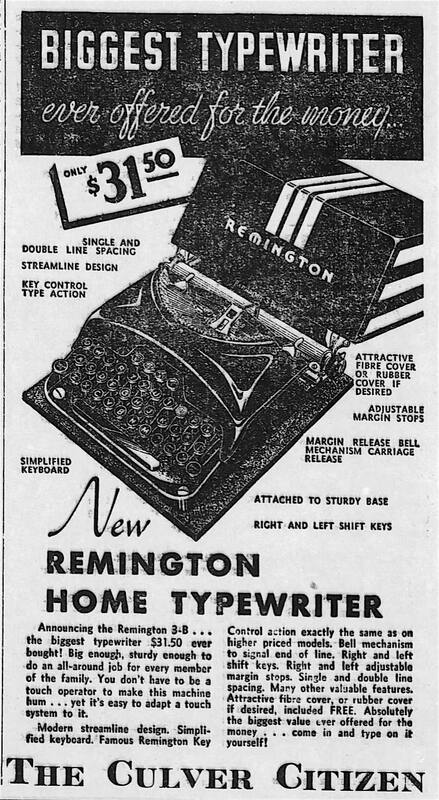 Remington advertised the machine as the “Home Typewriter” (i.e., meant for the home library, not toting? ), and images in advertisements show neither case nor cover, nor hinges. Note: If anyone has one of the more decorative covers, please send images to netadams (AT) gmail. © 2017, Mark Adams. All rights reserved.